Using leftover Cranberry sauce can be a challenge! While using it for mixing into smoothies is my favorite way to use it up, I will usually whip up a batch of this Cranberry Chicken as well, its a twist on the classic and favorite Russian dressing/apricot jam recipe you may be familiar with, and is simply delicious! I found this recipe over at Kraft. I often will substitute left over turkey meat for the chicken, and just heat it through with the sauce and serve over rice. This recipe also makes a great crock pot recipe during those busy December nights. In medium bowl mix the dressing, soup mix and cranberry sauce together. 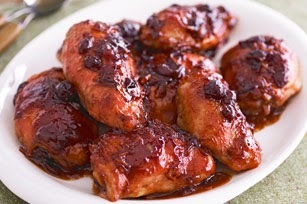 Pour Sauce mixture over the chicken and bake for 1 hour. (Can cook in Slow Cooker as well: 3-4 hours on high or 5-6 hours on low till chicken is cooked through).